Hello and welcome back! 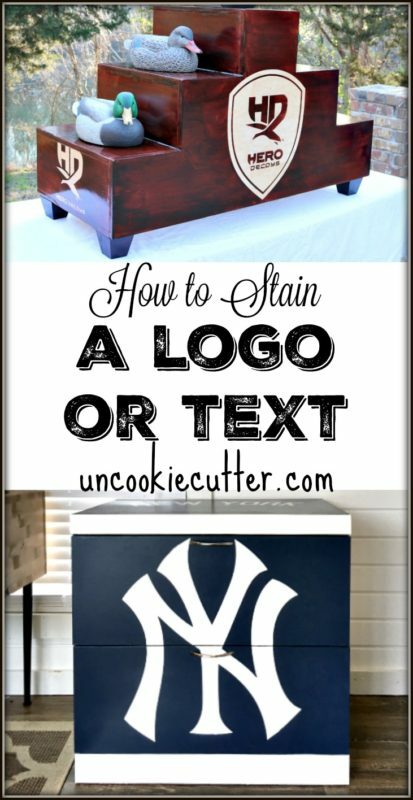 I wanted to share a quick little post because so many people have asked me about staining logos (or any text) onto a piece of wood. It’s actually quite easy to do. It’s basically the same as painting a logo or text onto something. I wasn’t sure this would work with stain, but it did. It does take a little time and effort, but it’s certainly worth it. 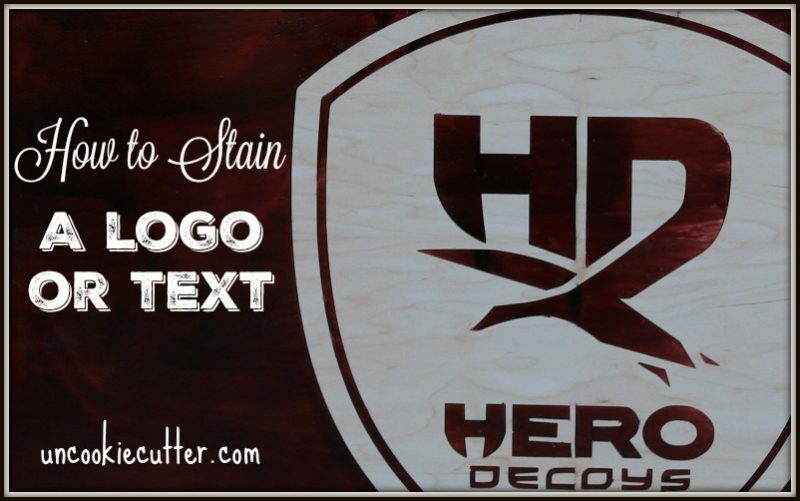 So, here we go…how to stain a logo. The first thing you’ll need to do is to make a stencil of your logo or text. I do this now using my Silhouette machine, which makes it so much easier. However, you can do it without and I’ll walk you through both methods. If you have a Silhouette or any cutting machine, you can print the logo out onto vinyl, remove the negative space and put onto transfer paper. If you are doing large logos, like the ones below, you’ll need to print it in multiple pieces. Click on the pictures to take you to the post of these projects. Now, if you don’t’ have a cutting machine, no worries! Well, it’s a bit more work, but you can totally still do it. First, get your logo or text and save it to a document at Staples and have them print it out as an “engineering print”. It’s available on the website and will only cost you a couple of bucks. Then, tape the print to vinyl and cut it out with scissors or a sharp razor blade. Again, a bit more tedious, but I did it this way for years before I got my cutting machine. 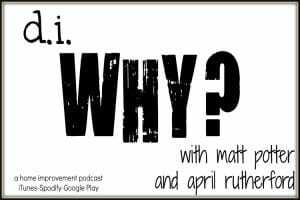 Now that you have your design, you’ll want to start by staining your surface the color you want the logo to be. 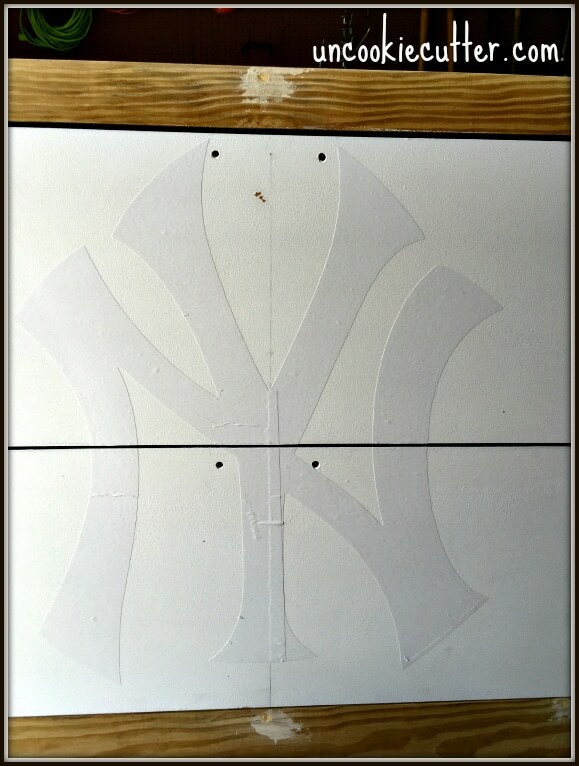 So, for the Yankee logo above, I painted the whole side white. 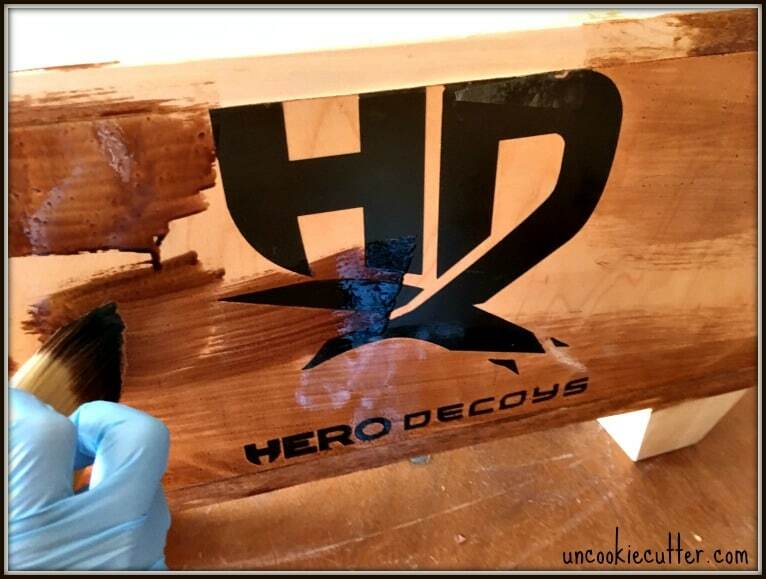 For the display stand logo, I stained that side a light classic oak – the closest stain color I could find to the color of the plywood. 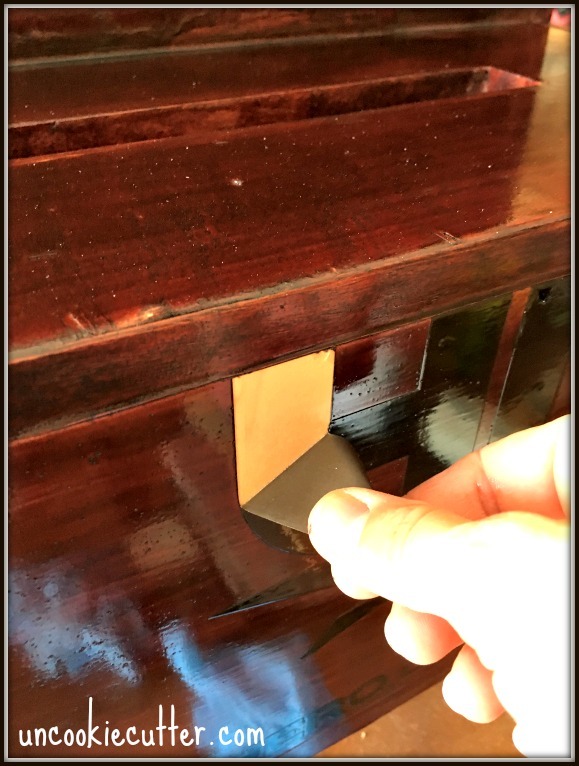 After two coats, apply your vinyl. This will be removed, so no worries about the color. 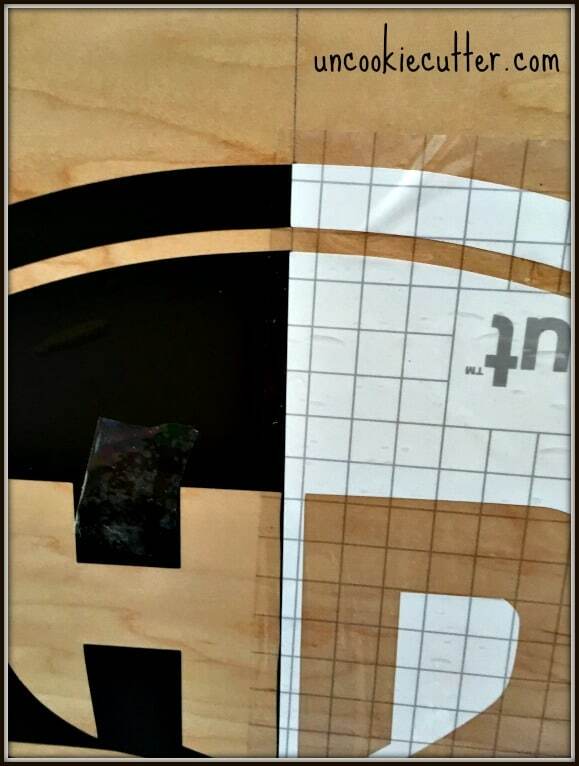 If you are doing a big logo, you’ll need to print it out on multiple pieces of vinyl and the piece them together. I drew a pencil line down the direct middle of the box, and then lined both sides of the cut out logo up with it. If you have a rip or tear, just put a little piece of tape over it like I did above. Again, this will be removed. Then, take a credit card or something similar and smooth out all the bubbles and make it stick as much as possible. Now, here is the trick to getting your lines sharp and crisp. 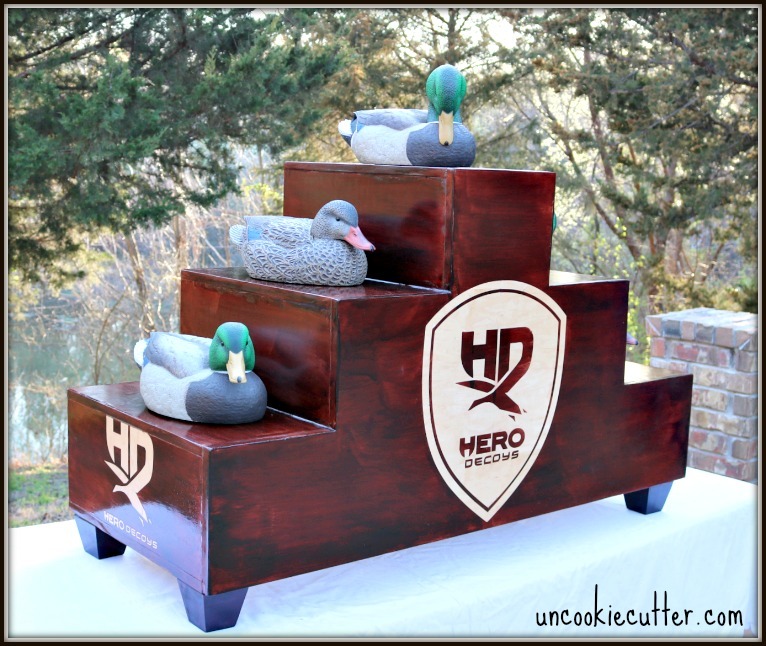 I know I’ve shared this before with paint, but I didn’t’ know if it would work when I was staining logos or not, but it totally does! Yay! Once you have your vinyl on, paint over it with the same color you’ve already used. So, in the picture below, I painted over the logo with the same color white as the background. This allows the paint to seep through any gaps or holes and seals your lines. 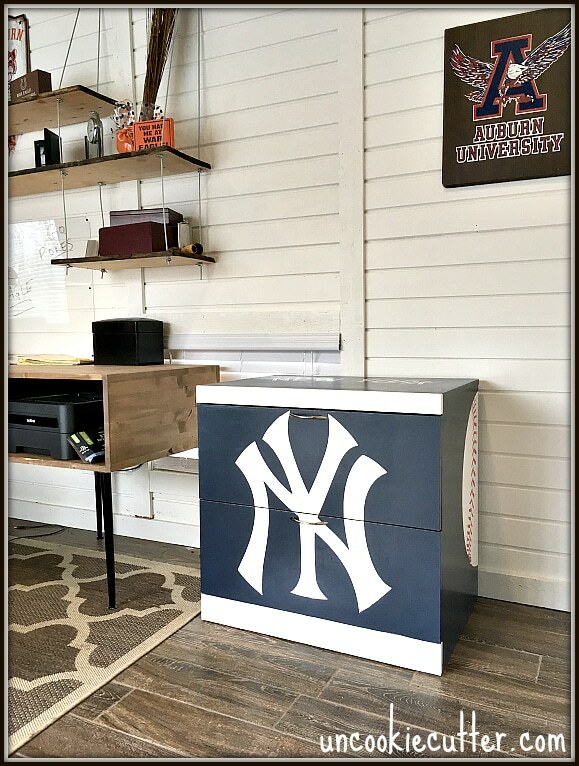 I did the same thing with the stain – painted over the logo and around all the edges with classic oak. This is the key, I can’t say that enough. Also, make sure you hit any taped spots just to make sure. Then, wait a good while for it to dry. Make sure it is dry dry dry. Then, paint the second color right over the vinyl, just like you did with the first color. Most stains and paints will need two coats, although if you are using a really good, high-quality paint, you might be able to get away with one. For this piece, I used Bombay Mahogany. Then, after the second coat is dry, peel the vinyl off. Use some tweezers or a weeding tool to grab the vinyl if you can’t’ get it. Then, just work on touchups. You shouldn’t have many, but I did have to erase the pencil line I drew to line the larger logos up and a bleed through here and there. Now, when I did this one, I used Minwax Polyshades. That way I don’t have to poly it when I’m done. I like PolyShades, but make sure you work out and drips and brushstrokes as you go. Especially with the darker colors, because they will show up if you don’t’ take the time to work them out. So, that’s it! 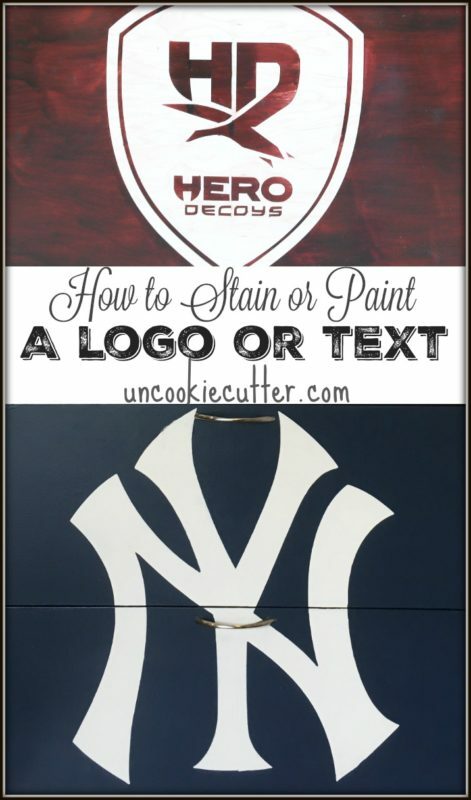 Staining Logos and text isn’t as bad as it seems, if you do it right it works just like paint. Make sense? Let me know if you have any additional tips or tricks below! 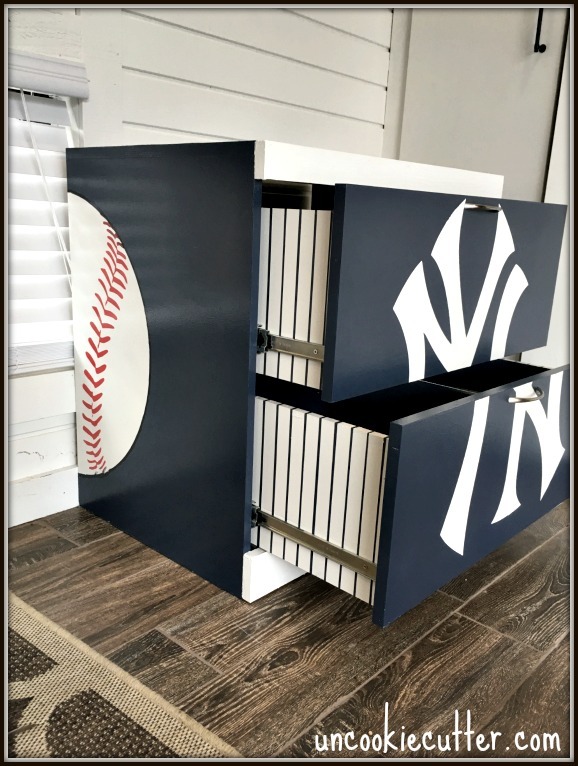 See the display stand build here and the Yankee file cabinet makeover here. 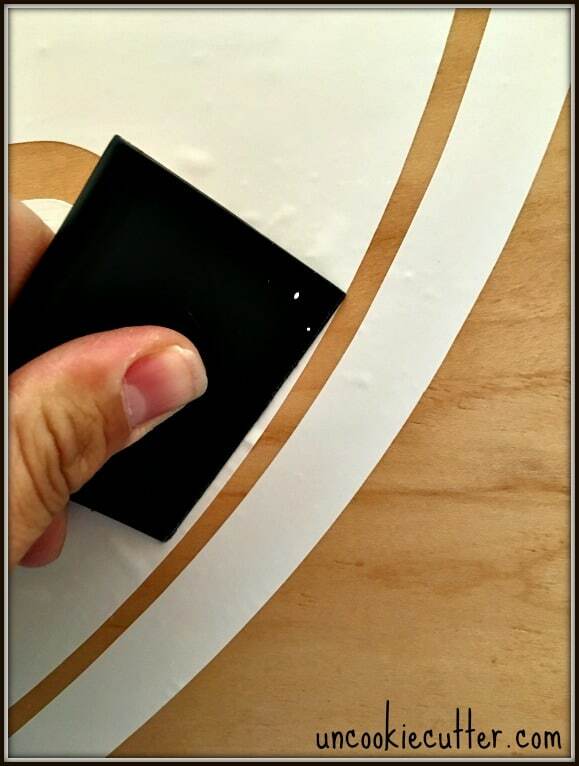 Your trick to go over the vinyl stencil with the same paint color is genius! I’m definitely bookmarking your post for future reference! It’s a life saver! Thanks Emily! This is an awesome idea! Thanks for sharing.. 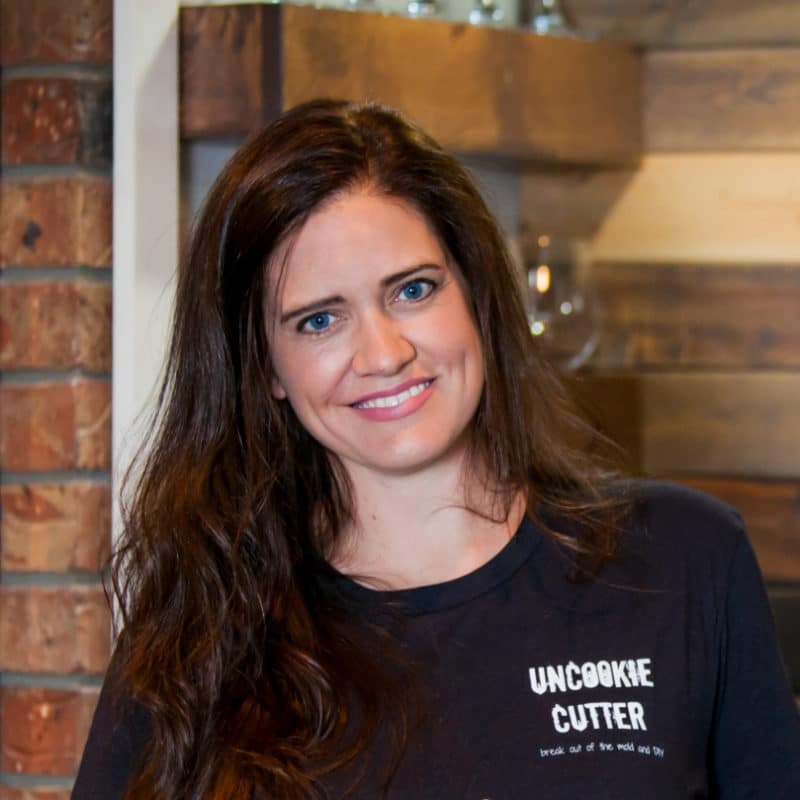 So what cutter do you use for cutting your vinyl? Hi Edward! I use a Silhouette machine. I like it, but I need to get better with it! Amazing blog. Thank you so much for share your informative post.